It's that time of the month again, time for another Lawn Fawn Inspiration week! 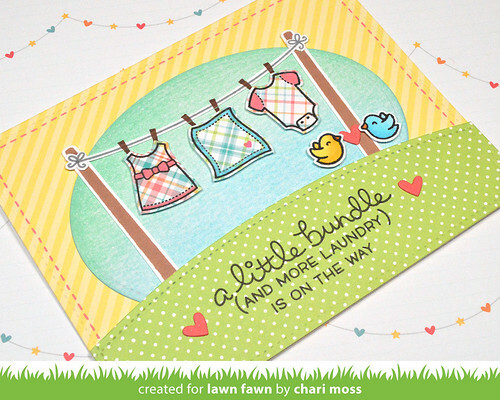 Today we are featuring the super cute baby set Little Bundle. I used the perfectly plaid papers to create some super cut baby clothes to hang on the clothes line. I cut a stitched oval from distress watercolor card stock and used cracked pistachio and tumbled glass distress inks to create a soft background. I used papers from the Let's Polka in the Meadow collection to cover the card base and create the simple hillside. 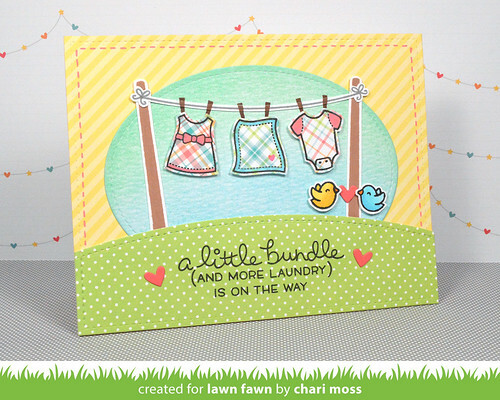 Be sure and check out the Lawn Fawn Blog for more projects with this cute set as well as a video and giveaways! Love the card - as a mother of six I totally agree! Oh my goodness Chari, I love that the laundry is all in plaids! SO SWEET!